With metals and commodities prices down quite a bit this last week, I felt the need to splurge on some supplies. I’ve got a small handful of events coming up, plus we’re right at the start of the holiday shopping season. I’ve been able to get myself a little better organized than I was at this time last year, so I’m more prepared. My material arrived today, and I’m spending a nice evening working on the assembly line with a Halloween-appropriate movie (28 Days Later) on in the background. Watch for some new designs for the holidays to appear in my shop soon! Sparkly…, originally uploaded by antigenre. Well, the winter holidays are coming, like it or not! 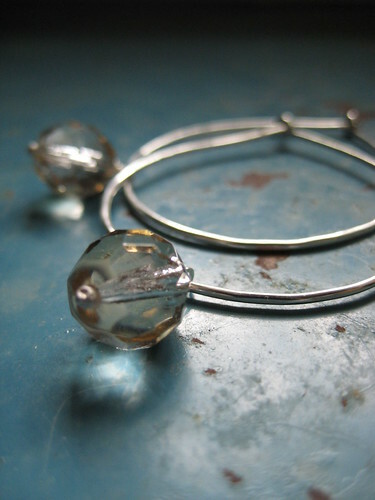 I’m going to go shopping today and stock up on some sparkly vintage glass beads to make a few festive items for the shop. It’s never too early to start figuring out what to wear to all those holiday parties! Something else that is on its way is my birthday, and to celebrate, I’m having a sale! I’ll be offering 20% off some ready-to-ship items. The sale will be in early November, after the presidential election. I figure it will be an ideal time for either celebratory shopping or consolation shopping, depending on your political persuasion. Either way, it will be fun, so check in in the near future for more details!